UBC is uniquely positioned to serve as a sandbox for the sustainable society. At first glance, the University of British Columbia’s on-campus incorporation of a biodiversity museum might not resonate as a particularly good omen for our natural world and ecosystems. Thankfully, it is more an indication of the path that UBC hopes to help guide humanity away from, as opposed to the route it has accepted as inevitable. John Robinson, executive director of the UBC Sustainability Initiative, sits in his office across from the Beaty Biodiversity Museum, overlooking an artfully overgrown and, yes, green courtyard. Indeed today, the billion-dollar catchphrase at UBC is “living lab,” and it would be a herculean challenge to spend any significant amount of time with any member of the administration and avoid speaking about the subject. in terms of sustainable infrastructure: a building that is “net positive,” incorporating geoexchange, rainwater harvesting, solar photovoltaics, salvaged pine beetle-killed timber and greenroof technologies. Robinson and his team are also focused on housing a community that is “happier, healthier and more productive”. The BRDP will harness Vancouver Parks’ biomass waste and convert it into 7.5 per cent of UBC’s electricity needs. In its quest for sustainability, UBC is naturally endowed with a variety of competitive advantages. It boasts unparalleled autonomy for a university—its endowment lands are outside of the City of Vancouver’s jurisdiction— and BC Hydro already provides the school with the vast majority of its clean electricity from hydropower. 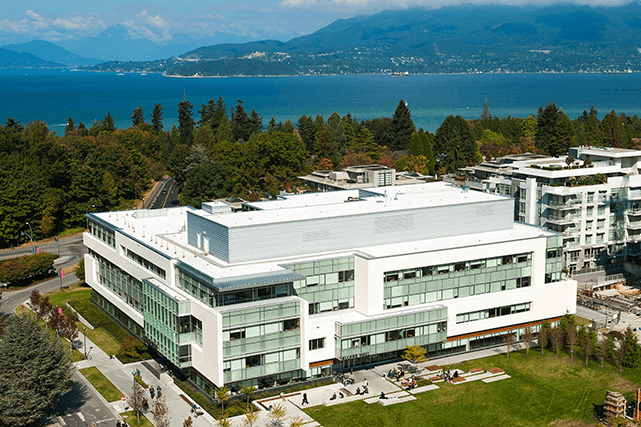 To stay ahead of the sustainability curve, however, UBC has begun to push the envelope in different arenas. It aims to create a culture of research, instruction, administration and operations that can help the university achieve carbon neutrality by 2050. The hope is that it can also be replicated outside the campus. Additionally, UBC is revamping its curricula to allow students in each and every faculty to pursue a minor in sustainability. In contrast to the nearly ubiquitous trend that has seen student groups in universities across Canada push their respective administrations towards sustainability, UBC has experienced the inverse. Most sustainability action has been driven by top-down initiatives. Justin McElroy, coordinating editor of The Ubyssey student newspaper, is blunt on student engagement. Though Robinson is acutely aware of this disconnect between the administration and student body, he has theories he is eager to test to help bridge the divide. Robinson also has high hopes for sustainability’s potential to permanently alter campus culture. “Sustainability could become something that’s fundamental to the identity of the university.” Perhaps it already has.